Bryana Hopkins surveys the floor. The junior forward drew the start Thursday against Nebraska. The last minute of the fourth quarter might have been the longest minute of the Wildcats’ lives. 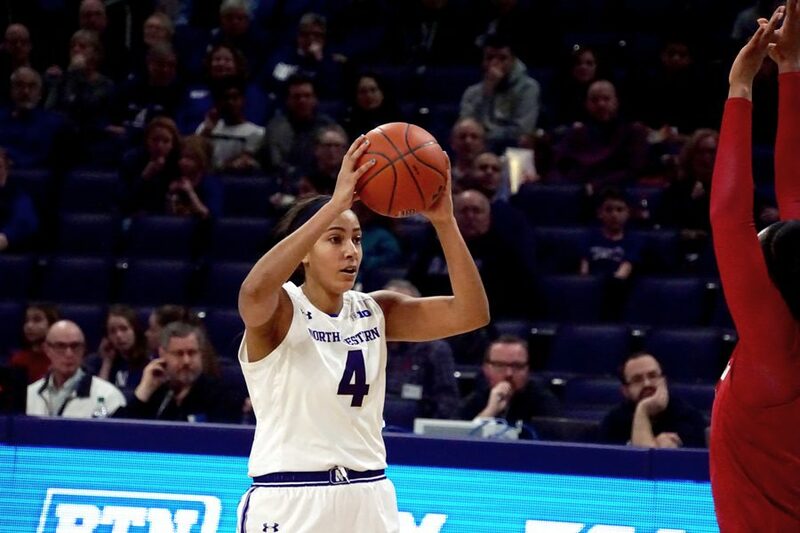 As Northwestern faced off against Nebraska on Thursday, the pressure was on in the final quarter as both teams knew what winning entailed. Prior to the game, both teams sat at 4-3 in the conference and were riding two-game winning streaks. The game was predicted to be a close matchup, as both teams performed similarly in the Big Ten circuit until that point; to make matters more nerve-wracking, they were separated by fewer than 10 spots in the RPI and were both battling for a top-four spot in the conference standings. In the end, the Cats pulled out the close 58-54 victory over the hosts thanks to some late game magic from NU’s senior forward Pallas Kunaiyi-Akpanah and freshman guard Veronica Burton. The game started slow, with the Cats maintaining relatively strong defense while lagging offensively against the Cornhuskers. The first quarter ended 11-9 in Nebraska’s favor, but it wasn’t long before NU’s star players attacked the net in the second quarter. Kunaiyi-Akpanah dominated every aspect of the game with 10 points and 19 rebounds, consistently pulling the team forward even during rough patches. Sophomore guard Lindsey Pulliam also exhibited one of her strongest performances to date with 21 points overall, 14 of which were in the second half. The Cats opened up a 10-point lead in the second half — their largest of the game — with Pulliam shooting clean buckets in the paint and Kunaiyi-Akpanah converting a putback as the first half expired, extending the lead at halftime. With little inconsistency, NU maintained a two- or three-point lead throughout most of the third quarter, but Nebraska began to pick up momentum and reduced the original 10-point gap to three points toward the end. The final minute of the third quarter was a turning point as the Cats led 37-34 entering the fourth. The pressure was palpable in the final quarter as Nebraska subbed in guard Sam Haiby, an aggressive player with renewed energy, who showed no fear in crashing to the ground to land a jump shot. Not only the players, but the crowd — one of the largest in Big Ten history — began to rise in volume. Fouls started piling up as both teams brought the aggression, bringing the point margin closer and closer. Northwestern stopped defending man-to-man, spreading defense thin and allowing Nebraska to land game-changing shots. McKeown said the Cats forgot about guard Taylor Kissinger, who landed a three, bringing the score to 49-48. It truly became anybody’s game, however, when the Cornhuskers took a 54-53 lead with 37 seconds left in the game. The crowd held its breath as McKeown called timeout. The game became action-packed in the last 10 seconds with successful free throws from Burton, and then a great moment from sophomore guard Jordan Hamilton sealed the game. The team was overjoyed with the win, not only because it was the Cats’ third straight in the conference but because it displayed their ability to maintain calm even when the game became dangerously close. Moving forward, the team hopes to play exactly as they did Thursday night against their next tough opponent, Illinois. But with the same strong defense and stunning performances from players, McKeown is confident about their odds.